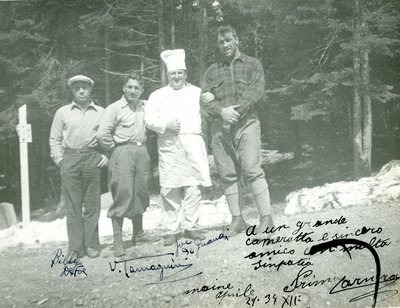 "Primo Carnera with His Training Crew in Maine "
A black and white photograph of boxer Primo Carnera with his training crew in Maine. Autographed in Italian, "A un grande cameratta e sincero amico un multa [sinpatia? ], Primo Carnera." Also signed by trainer Billy DeFoe, an unidentified man whose signature appears to read V. [Tarraguire? ], and chef Joe De Grande. Maine, April 24, '34.